First, before we get started – it’s important to understand social giving. Social giving combines personal relationships, social networks and connections with a philanthropic cause, to generate giving. Put simply: it’s about using your built-in social networks to engage new supporters and drive more donations. So who are Social Donors? Social Donors give to ticketed fundraising events (e.g., galas), peer-to-peer fundraisers, and/or occasion/challenge campaigns. You know them. They attend your events, they participate in your peer-to-peer campaigns and they donate to your online challenges. They are also a growing force in charitable giving. Almost 25 percent of U.S. adults (identify themselves as Social Donors, which presents nonprofit organizations with a 58M new donors to target. Now that’s a donor base worth understanding! Like any donor segment, this group has unique motivators and giving behaviors. They give for very different reasons than a traditional donor. 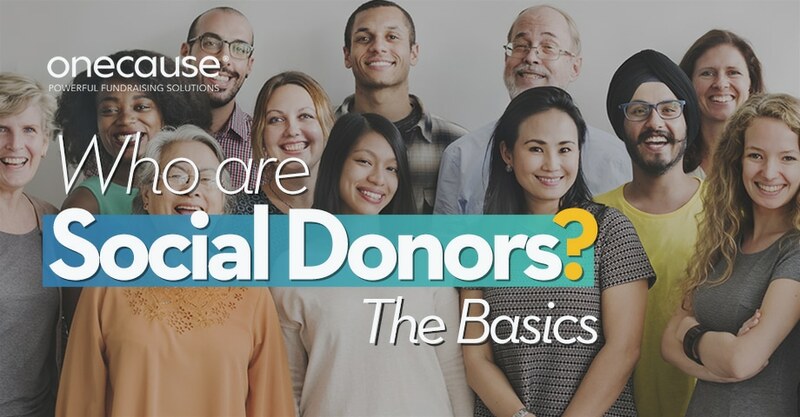 We wanted to outline the Social Donor basics, including tips to start capitalizing on these givers to increase donations. Why are Social Donors Important? The majority of Social Donors come across a nonprofit giving opportunity because they hear about it from someone in their social network. That means a friend, colleague, or family member shared an email, social post or talked directly to them about a nonprofit cause or event. While traditional advertising and event marketing activities do play a role in how Social Donors hear about fundraisers, their main influencers are their social networks. The good news is, they don’t necessarily have to be familiar with your charity to give. Close to 40 percent of Social Donors are first-time donors, meaning with a little work, you can attract a new group of supporters to your fundraising. The future of fundraising has evolved beyond the single donor. Thanks to rise of the Social Donor, nonprofits should now focus on how to harness peer groups into your giving programs and events. There’s great opportunity in unleashing the power of Social Donors! Social Donors have distinct giving behaviors and typically like to continue giving in the same ways. While Social Donors all have a few things in common (one being a strong reliance on social networking) there are some clear differences between the three main groups: Event Donors, Sponsor Donors, Occasion/Challenge Donors. As your team builds out a Social Donor strategy, recognizing the unique differences, behaviors, and motivators can boost your efforts and increase donations. This group is more familiar with and involved in an organization in a personal way. Most event donors have given to an organization before in some way and are well on their way to being repeat or long-term supporters. They also tend to give higher donations, due in large part to the nature of the charitable events they’re engaged in, which are typically more large-scale affairs than a simple social campaign. The average demographic profile of a typical event donor skews towards males between the ages of 23 and 50 with higher incomes. Sponsor Donors connect with organizations when someone asks them for a fundraising sponsorship , such as backing an individual or team in a walk, run, or ride. While they might not be intimately familiar with an organization’s mission before donating, they do know enough about an organization to make a conscious donation choice. Sponsor Donors also tend to leverage online donations more than Event Donors. This group is more likely to be comprised of older women with a median to above-average income. These are one of the most social groups and typically donate to social-only campaigns on a special occasion (like a birthday) or for a challenge (like the Ice Bucket Challenge). This group is made up of more new donors than repeat donors and is truly dedicated to the ‘social’ aspect of social donations. This group is overwhelmingly female-oriented with median household incomes that are lower than Event or Sponsor Donors. What do Social Donors prioritize? Now that you know a little bit about who Social Donors are, it’s time to understand how to attract them to your efforts. With so many competing fundraising options, events and campaigns, gaining the attention and action of Social Donors is critical. When asked what is most important when considering a fundraising opportunity or event, Social Donors prioritize based on three key factors: mission, impact and ease. Social Donors want to understand how their donation will make a difference. . That means a nonprofit’s mission, impact and reason for giving needs to be at the forefront of any message in order to engage Social Donors. They also want their giving to be easy, so it’s time to examine your traditional and technology-based giving opportunities to ensure a seamless experience. For more insights into the reasons they are motivated to give, here’s a breakdown of their top priorities by Social Donor type. Now that you have the basics on Social Donors; who they are and what makes them tick, it’s time to think about how to incorporate them into your development strategy. We surveyed 1,056 social donors to provide a deep dive on the unique motivators, mindset, and makeup of today’s Social Donors. Learn more by downloading the study here. Look at your events, your peer-to-peer campaigns, and find your Social Donors. Who are your first-time givers? Where did they come from? Who are your repeat givers? What do they give to? Who brought in the most giving via social networks or channels? What’s you median gift? What platforms are you engaging them? After you’ve analyzed your Social Donor base, use the data to create your ideal donor profiles. Create new donor personas with Social Donors in mind. Next up take your fundraising calendar and map out which events, campaigns, and challenges would appeal to Social Donors. Create a marketing and communications plan that puts your mission at the forefront. Identify top donors of influence in your community, these can be the foundation for your Social Donor plan. They should be supporters you can to help promote your events and campaigns on social media and in their networks. Set goals for Social Donor engagement and gifts to measure your results. Once you’ve got your plan in place, it’s go time! You can begin attracting Social Donors to your events and fundraisers, and start leveraging this growing donor group for more powerful fundraising. Not done? Want more Social Donor resources?